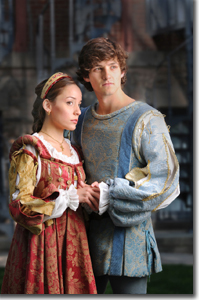 As "Shake-speare's" greatest romantic tragedy, Romeo and Juliet has been adapted countless times for different eras and mediums, yet when the original is performed well, it sets the bar for all that follows. In the Colorado Shakespeare Festival's current production, directed by Lynne Collins, we see clearly why this is so. From the first skirmishes between the Montagues and Capulets in the streets of Verona, to the immortal balcony scene, to the fatal slayings of Mercutio by Tybalt and then Tybalt by Romeo, all the way to the tomb, Collins crafts a superb story, with only a couple of blips along the way. The subtlety of Collins rendition is literally amplified by body microphones, worn this year for the first time in the history of the venerable festival, thanks to an anonymous donor who deserves a hearty, "Thank you!" The payoff is naturalism in acting style and corresponding vocal nuances akin to what we experience in the intimacy of big-screen cinema. For example, early in the balcony scene, when Juliet (Jamie Ann Romero) appears, while Romeo (Benjamin Bonenfant) is still expressing his feelings to us, but before he reveals his presence to her. Juliet begins to share her feelings aloud. Romero is smiling while she recounts, in a soft voice to herself, the love-struck moments at the dance. Hearing this as if we were in the courtyard instead of twenty or third yards away in the outdoor amphitheatre is a revelation in heartfelt intimacy. When Romeo finally speaks, we are shaken from our reverie and bowled over, just like Juliet, ending up on our keisters ... and that was just the warm up! The unhurried and genuine expressions from both Romero and Bonenfant of the finest poetry in the English language, spoken in the foremost archetypal love scene in the Western literary canon, on an idyllic balmy night in Boulder, is alone worth the price of admission, but there is more. Romero's Juliet and Bonenfant's Romeo are both intelligent and hormonally challenged, as they should be, buffeted about in a world concerned more with arranged marriages in support of property consolidation than with "love at first sight" and all that follows from that rare and dangerous rhapsody. There is never a moment that we doubt their commitment to each other, from those first transfixed glances at the dance to the last spasms of life as they each pass, believing the other dead. The production offers sublime moments at every turn: the nuanced anger of Lord Capulet (Mark Rubald); the unspoken exasperation of Lady Capulet (Karen Slack); the compassionate Friar Laurence2 (Erik Sandvold); the seething Tybalt (Benaiah Anderson); and the jockular Benvolio (Genesis Oliver), to mention a few. For a nobleman, it is somewhat surprising to see the playwright criticize so directly the institution of marriage as it was employed among his Elizabethan contemporaries, yet this contrary disposition overlaps the life of the author, where arcane laws and customs often interfered with the heart's desire. To miss the playwright's intent regarding these matters is to marginalize his message. Yet, that is the case, unfortunately, at the conclusion of this production and, strikingly, with CSF's previous production of this play in 2004, both of which cut the scenes that deal with Friar Laurence's attempts to send Romeo a message regarding Juliet's death-like ruse and with the Prince of Verona's concluding admonition for the parents. ... then the events which define the star-cross'd lovers—both the untimely and timely—need to see the light of day as well, including the first meeting at the dance, the balcony scene, the marriage, and the consumation, as well as street battles, Paris' overtures, Lord Capulet's dictum to Juliet, Tybalt's death, Romeo's banishment, the diverted note to Romeo, Paris' death, and the Prince of Verona's final words to the Montagues and Capulets. Otherwise, "star-cross'd" is diluted and the parents are let off the hook for their role the tragedy. It is indeed "a tale of woe," but not wholly due to the stars or fate; the playwright gives equal shrift to personal responsibility. While we understand the considerations involved in cutting the length of Shakespearean drama to attract and maintain attention-challenged audiences, there must be a balance that retains the integrity of the playwright's message. If, like oft-quoted critic Harold Bloom says, "Shakespeare invented the human," then what disserve we do to ourselves and our progency when "dumbing down" the text without biographical context; instead, how about raising the bar, just as the playwright did? The Colorado Shakespeare Festival's production of The Comedy of Errors runs through August 11th in repertory with Romeo and Juliet, The Inspector General, and The Little Prince. 303-492-0554 or www.coloradoshakes.org. Surely, this is the bookend to the prologue! 2 Friar Laurence is a memorial to Laurence Nowell as well as Sir Thomas Smith, two of de Vere's teachers, both of whom were expert in horiticulture, herbology, and potions, among other disciplines. Smith, one of the pre-eminent scholars of his day, was a pioneer in scientific pharmacology. Refined references to such are rife throughout the canon. On a side note, Nowell brought the only copy in Britain of Beowulf to Cecil House, where de Vere was a ward, from which the poison-tipped swords in Hamlet were derived.